By using a USB to micro USB cable such as this one and connecting your Kindle or Kobo to a Mac or PC desktop computer it will pop up as a USB drive. Open up the drive and place the eBook file in either the Books or the Documents folder. Disconnect the kindle and start reading! You can send documents to your registered Kindle devices, free Kindle reading applications, and your Kindle Library in the Amazon Cloud by e-mailing them to your Send-to-Kindle e-mail address ([name]@kindle.com). Your Send-to-Kindle e-mail address is a unique e-mail address assigned to each of your Kindle devices and free Kindle reading applications upon registration. To find your Send-to-Kindle e-mail address, visit the Manage your Devices page at Manage Your Kindle. To send a document to your Kindle device or app, simply attach it to an e-mail addressed to your Send-to-Kindle e-mail. 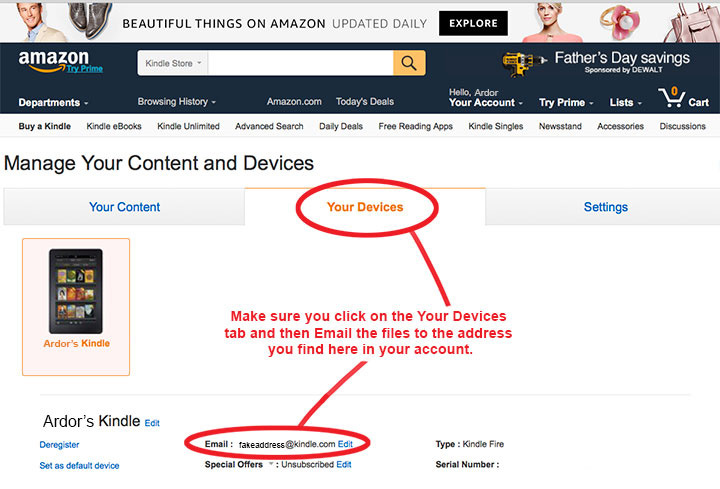 To find more information about how to use your Send-to-Kindle e-mail address, please visit Amazon's Help Page.